Even with the most careful and conscientious treatment, acne scars may still occur. 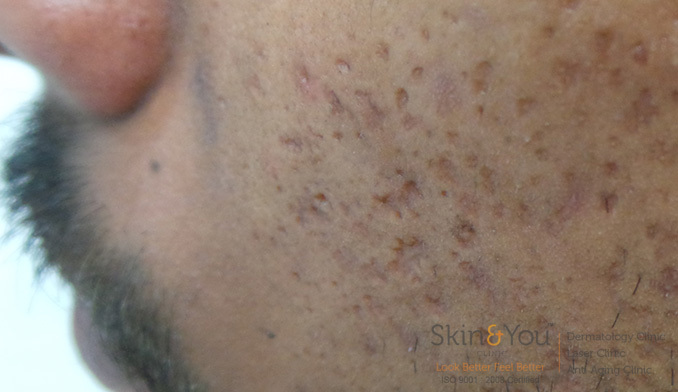 Severe nodular and cystic acne (For more information click on Acne) as well as pricking of acne may result in acne scarring. Each acne lesion has the natural ability to heal itself. Every pimple results in loss or formation of tissues. The loss of tissue results in milder scars, while formation of new, thicker tissue can result in more severe scars. Rolling Scars: This type causes rolling or “wave-like” undulations across otherwise normal-appearing skin. Boxcar Scars: They are round or oval depressions wider than ice-pick scars. Hypertrophic Scars (click to read more about hypertrophic scars): They appear as firm, raised masses of tissue and are usually larger than the original acne in size. Creams and Lotions– Various creams or lotions containing retinol, vitamin C and alpha and beta hydroxy acids help in resurfacing of the scars. They are more effective in superficial scarring. These topical creams are often used as a combination with various other procedures done for scarring. Scar Filling – Deepscars which are formed while acne is in resolving phase leads to puckering of skin and scar formation. In Scar filling with the help of needle these bands are broken painlessly and the tension over the skin is released, helping in filling of the scar and treatment of scars. More like a sandwich treatment for scars. Up to 90% scar filling can be achieved with this method painless and extremely effective. Why skin and you clinic for Acne scar treatment? We, at Skin & You Clinic, after assessing disease severity and type of scarring, plan an individualised treatment to get the acne controlled along with decreasing the scars so as to achieve the best cosmetic result as possible.